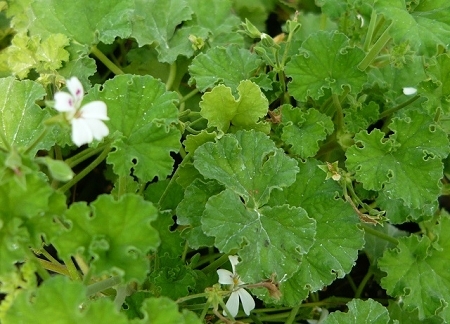 Apple Scented Geranium (p. odoratissimum) - Large rounded green leaves with a strong apple fragrance. Continuous blooms of small white flowers. Rounded and trailing compact habit makes a magnificent container plant. Perennial zones 10 - 11+ Live starter plant in 3 inch container.